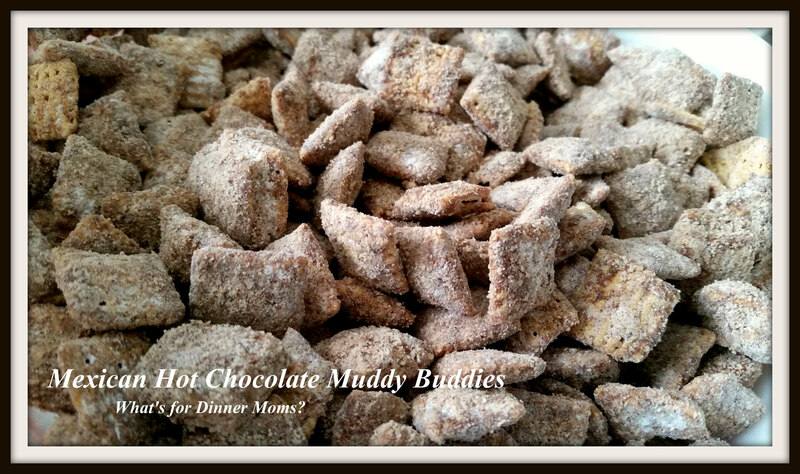 Mexican Hot Chocolate Muddy Buddies – What's for Dinner Moms? Are you celebrating Cinco de Mayo today? My daughter made this for us to snack on during the day. She loves making and coming up with all sorts of combinations for Muddy Buddies. This is a great recipe to make with kids. They can stir and pour! Melt chocolate chips in a microwave safe bowl in microwave. Once chips are melted add butter to dish and stir well. Mixture should be like slightly thinned frosting. In a bowl place cereal. Pour the chocolate over and stir well. To completely coat cereal. Add powdered sugar, brown sugar, and cinnamon to bowl and coat cereal with mixture. Place in sealed container to eat later or serve. never heard of this but looks good. Muddy Buddies have been around forever. There are tons of variations on them. Add candies, nuts, raisins, and spices and create a whole new flavor. Happy Cinco de Mayo! Looks tasty! Oh wow! This looks incredible. I’m a huge fan of muddy buddies!! Is this no longer called Puppy Chow? I am so un-hip! Thanks, it is referred to by both terms. Usually if it has chocolate in it the call it Muddy Buddies. This sounds like a delicious and fun recipe! Do you think you could do this with white chocolate or dark chocolate chips? Then you could mix them together in a bag to have a combination. Certainly! My daughter doesn’t like the bag method because it tends to stick for her but others use it all the time. I am SUCH a chocolate freak, and your recipe is right up my alley. There is truly nothing more pleasing than some good old melted chocolate. Gorgeous photography, too! Muddy Buddies are so addictive. I’ve made something similar before, and my pics certainly do not compare. I cannot wait to give this a shot. Thank you for sharing.